Jan Chipchase has done something few of us would dare: write down his trade secrets and give them away in a book. 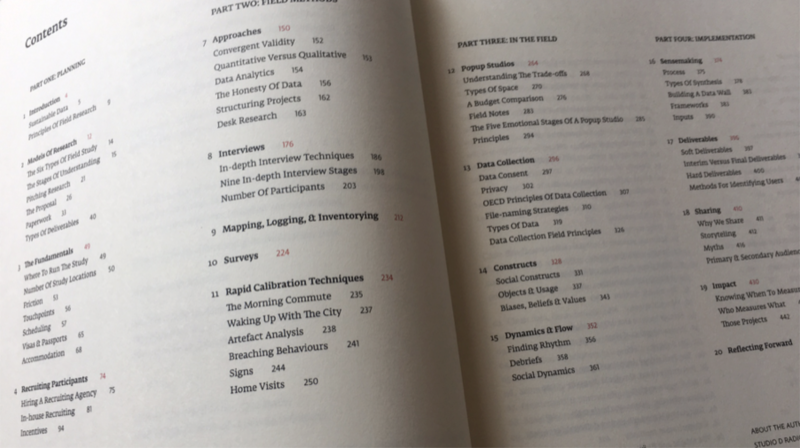 In The Field Study Handbook he shares hard-earned lessons from running ethnographic research projects across the world. At face value the Handbook delivers on its promise. It lays out, often in painstaking detail, the nuances of how to stage a successful project. Everything from costing a proposal and folder-naming strategies, through to how to seat a team during a fieldwork interview and make an impact with your deliverables. But importantly, it also communicates a human, sometimes esoteric perspective about why we choose to do this kind of work in the first place. And it is this that elevates the book from a useful how-to guide to something more vital and existential. 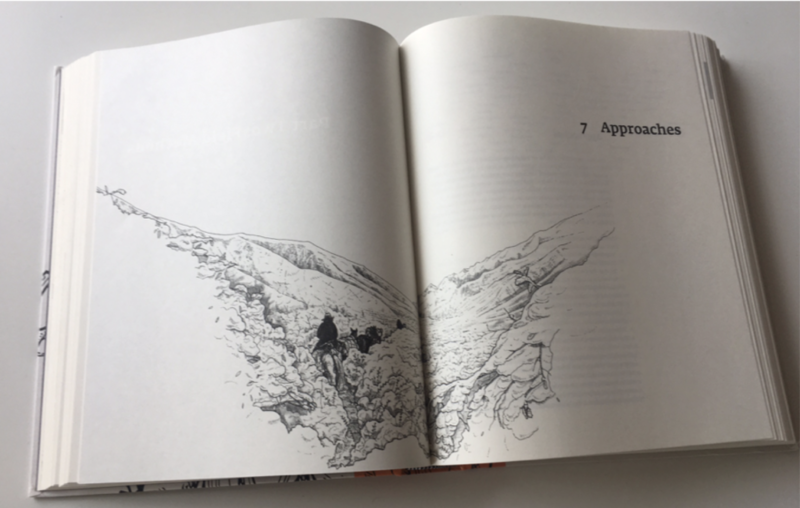 Sharp insights can be found on most pages, particularly in relation to the author’s true passion – running projects ‘off the grid’ in developing countries. The text is at its best when Chipchase relates how fine-grained cultural distinctions should shape our research practices, to enhance our understanding but also because it is more ethical to do so. It is to his credit that a deep respect for the subjects he studies resonates throughout the book. Given the personal style, Chipchase focuses on describing methods that have worked in his own experience. He is less interested in situating his wisdom within the wider canon. As a practical guide it is understandable that there is not more theoretical context. This said, a wider bibliography would contribute a richer depth of field, and help the reader navigate the commercial and academic traditions he draws on. 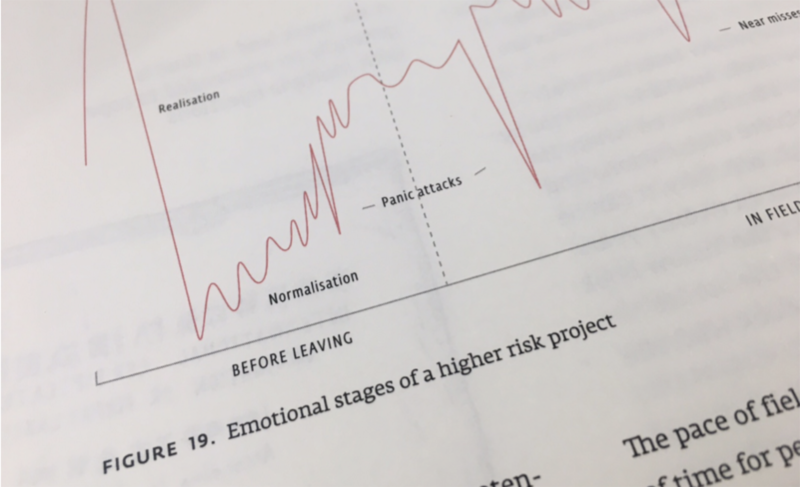 Overall the accessible nature of the Handbook means experienced commercial ethnographers will feel reassured and re-orientated by much of the methodological advice, rather than surprised by it. What makes it a worthwhile purchase for even the most jaded researcher is the care for the craft that bleeds from every page. And this is perhaps the highest praise I can give it: reading it makes me feel proud of what I do for a living. Chipchase has deliberately pitched the Handbook at a wide audience to support a proselytising mission. He wants to democratise the ethnographic skillset in a world increasingly at sea in rootless data. This is a message that won’t be welcomed by everyone. For some researchers, democratisation represents a threat. It calls into question the value of professionals, eroding belief in our expertise. If anyone with this book can be a researcher, then why pay over the odds for a specialist? Chipchase’s answer is to subtly suggest that although anyone can do research, mastery of the art is something else entirely. This is a clever move: opening-up the practice to everyone, while simultaneously revealing the skill and complexity of doing it well. Popping the bonnet on the fieldwork process also communicates a confidence about the value of the work. Transparency is a clear and welcome theme of the book. Why obfuscate, he seems to ask, unless you’ve got something to hide? The Handbook is also another demonstration of Chipchase’s undoubted skill as a marketer. He has always appreciated perhaps the most powerful strategy for promoting ethnography: make it glamorous. And position it as far from the staid world of Market Research as possible. In the process, no one has done more to make our work look and feel exciting to outsiders and insider alike. It is no coincidence that during the successful Kickstarter campaign the Handbook could be purchased in combination with bags from his boutique luggage brand SDR Traveller, or with ‘field trips’ to exotic destinations in China and Japan. There is a distinct knowingness to everything that Chipchase does, but like any trailblazer the irony is never explicit – to betray as much would be to dilute the vision. Drawing from the approach of smart lifestyle brands, Chipchase is building a rich, distinctive world that people aspire to be part of. Although some purists may dismiss this as a dilution of our practice, there are arguments for making ethnography both accessible and aspirational that extend beyond raising its profile. As we argued at EPIC last year, enrolling non-practitioners as active participants in the research process can fundamentally enhance their level of understanding, and the subsequent impact of the project. Chipchase calls these ‘Soft Deliverables’; the ineffable value that is imbued through directly participating in fieldwork. It is right to celebrate the transformative power of our work, but Chipchase notes a tendency for practitioners to overstep the mark and “assume project success translates to the overall success of the whole [system]”. Despite the temptation, we shouldn't claim that one project can drive complex changes singlehandedly. This doesn’t mean we should lack ambition as a community, but rather reflect on our collective approach to promoting our work. Within organisations, talk of impact is still dominated by positivist, number driven language. Despite our sophisticated arguments for widening the vocabulary, it is perhaps a dialect we will always struggle to be entirely persuasive in. Chipchase teaches us that to grow our influence we need to move beyond rational arguments. Ethnographic work must appeal to the heart as well as the head. Because if marketing demonstrates anything, it’s that investment follows the emotional before the rational. In promoting the Handbook on Kickstarter Chipchase states, “I wanted to create an artefact. A beautiful thing that takes up space in your life, and nudges you with its presence.” At $125, the Handbook is undoubtedly a luxury item, seemingly targeted at a niche audience. But the book defied all expectations and raised over $330,000 on Kickstarter, reaching a wider market than anticipated. The real lesson of the Handbook then may not be contained in the excellent guidance it affords, but in the controversial dynamic it reveals: the success of ethnography as a Veblen good. 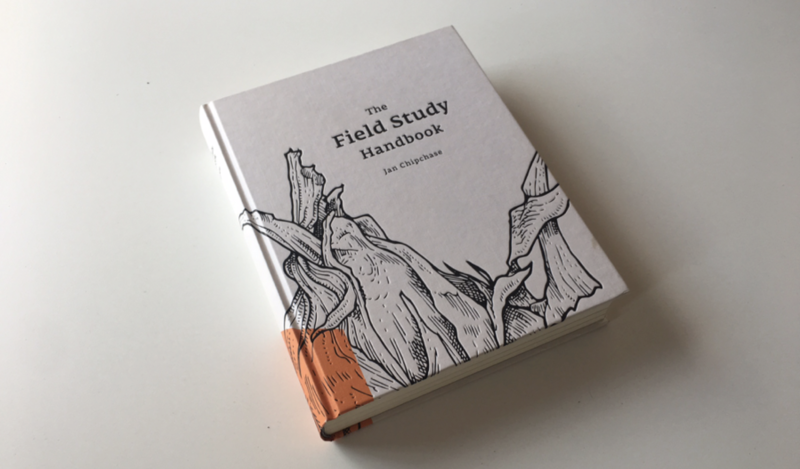 The Field Study Handbook by Jan Chipchase, illustrated by Lee John Phillips. Field Institute, 2017. Tom Hoy is Co-Founder of Stripe Partners, a global insight and innovation consultancy that helps organizations develop 'Embodied Strategies' through their collaborative Studio approach. Over the last 10 years he has continuously experimented with research methodologies across a range of organizational settings. 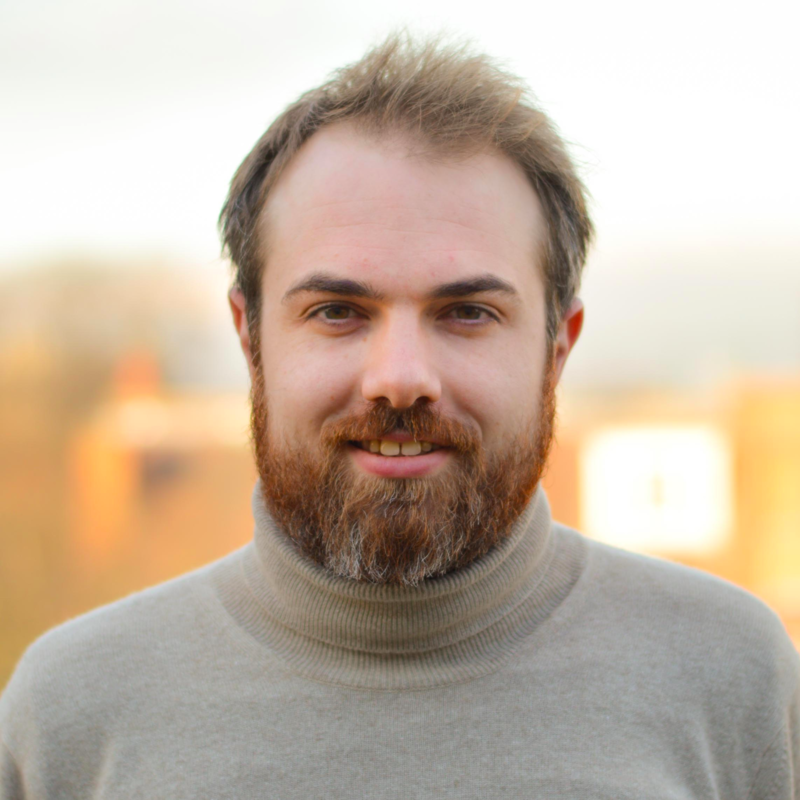 Outside of Stripe Partners Tom developed the Made In Lambeth innovation network in London, bringing together multidisciplinary teams to support local causes. His training in social sciences started at the London School of Economics.